Last week I discussed gutters and downpipes, this week its windows and doors. The first checks with windows and doors are obvious: Is there evidence of rot or damage? Do they open properly? White PVC double-glazing, wooden casements (hinged) and sashes (slide up and down). Contrary to popular belief, all these can be double-glazed by cutting the rebate (slot that holds the glass) deeper to allow for thicker glass. You also still find old galvanised metal casement windows from the 1970s and earlier, but thankfully they are becoming rarer. They are durable, but very bad for heat-loss and ideally need replacement. The main problems with PVC windows are corroding or buckled hinges and runners, which can be replaced from the manufacturer if they are still in business. If not it may be possible to locate replacements over the internet as a few companies are starting to spring up offering replacement hinges. Otherwise you could end up paying for a whole new window! The other problem is the seal going on the D/G unit, evidenced by condensation between the glass. These are usually quick and inexpensive to replace. Some early PVC windows oxidised badly in sunlight, causing discolouration and brittleness of the plastic. It’s usually quite visible, these may need replacement. Wooden windows also need checking for ease of opening and closing. Be careful! If there are no cords in a (sliding) sash window, the top sash may fall and smash on the sill when you open the catch. If unsure, it’s best to hold it up with one hand while slipping the catch. Stiff, rattly sash windows with frayed cords can be given a minor overhaul by a good carpenter in a couple of hours. The same goes for stiff hinges or jamming on casement windows. But if the timber is rotten it may require more work. The bottom rail of the casement or sash (opening portion of casement or sash windows) often rots too. This is repairable, but if both sill and bottom rail need repairing, it may be cheaper to replace the whole thing. Doors have similar problems, and wooden doors rot in similar places. Shamefully, exterior doors are rarely painted underneath (where it doesn’t show but is most needed), so premature rotting underneath is inevitable on many. A drip bar fitted along the front would help. Also check the ends of the middle rail on panel doors. These are very wide and expand and contract with changing seasons, often cracking along the grain and letting water into the joints. 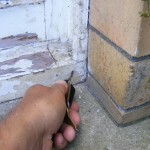 Door frames rot in similar places to window frames, and can be assessed and treated the same way. Replacing a front door and frame, plus the little window above if there is one, can easily be a couple of days work for a good carpenter, plus materials, particularly if the frame is built-in to the walls. All in it might cost £600 – £1,000. If you have problems with a plastic door, you may have to improvise a repair or replace the whole thing. They require specialist parts to repair, but sometimes these can be found on the internet. Next week I’ll cover damp problems around windows and doors.